Be the first to share your favorite memory, photo or story of Nona. This memorial page is dedicated for family, friends and future generations to celebrate the life of their loved one. 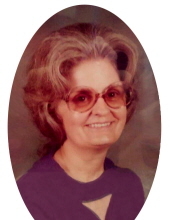 Nona Maxine Bartley, 94, formerly of Mount Sterling, Kentucky, passed away January 17, 2019, at Lady Lake the Villages, Florida. Born February 23, 1924 in Pike County, Kentucky, she was the daughter of Silas and Alma (Adkins) Bartley. Also preceding her in death was her husband, McKinley Bartley; two sons, Larry Ratliff and Jackie Bartley; and one grandson, Chad Ratliff. Siblings preceding her in death were her sisters, Allene Stewart, Bessie Bartley, Ivory Coleman, Ethel Childers, Lestie Stewart, and her brother, Silas Jack Bartley. Nona is survived by two grandsons, Kenny Ratliff (Tiffany) of La Grange, Kentucky, and Michael Ratliff of Wallace, North Carolina, and five great-grandchildren, Will Ratliff, Bryce Ratliff, Ethan Ratliff, Brianna Mekelburg, and Trevor Mekelburg. She also leaves several nieces, nephews, extended family and friends. In addition, wonderful caregivers, Lindsey and Marti Garrison of Florida. Nona was born and raised in Pike County. She then spent several years with her husband working in Chicago, Illinois, prior to moving to Jeffersonville, Kentucky. For a number of years, she resided in Mt. Sterling, Kentucky. She then enjoyed her remaining years in the Leesburg area of Florida. Funeral services will be conducted at the Machpelah Cemetery chapel in Mt. Sterling at 10:30 a.m. Saturday, February 9, 2019, with Wendall Clevinger leading the ceremony. Following the services, she will be laid to rest near her sons. To send flowers or a remembrance gift to the family of Nona Maxine Bartley, please visit our Tribute Store. "Email Address" would like to share the life celebration of Nona Maxine Bartley. Click on the "link" to go to share a favorite memory or leave a condolence message for the family.